If your idea of dental care involves drills and shots, then you’re in for a pleasant surprise with laser dentistry . Laser dentistry allows your dentist to perform a variety of dental treatments without the drill and often with only a small amount of anesthesia—or no anesthesia at all. 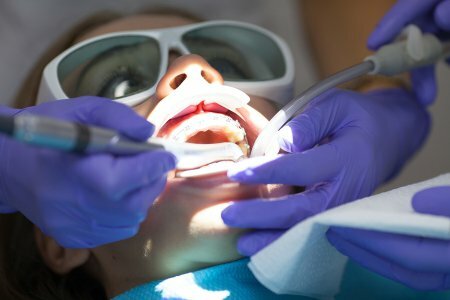 If your dentist has recommended that you undergo laser dentistry, you’re likely to have some questions. Here is what you need to know. Laser dentistry uses laser energy to perform a variety of treatments, from restorations and gum care to pain relief for cold sores . Lasers have been increasingly used in the medical community for a number of different purposes, and dentists are using them more than ever before to make treatments more comfortable and less invasive. At Glenwood Premier Dental, we use the Waterlase system to provide the most advanced care possible for our patients. One of the biggest benefits of laser dentistry is that it eradicates the need for the drill. Through laser energy and water, your dentist can quickly perform procedures that would have required extensive drilling in the past. Not using the drill means that procedures are less invasive and require less recovery time. Likewise, procedures can be performed with little to no anesthesia. There is less bleeding and swelling during and after treatment, and the laser allows your dentist to provide increased precision. What procedures can be performed using lasers? Laser dentistry is used for cavity treatments, preparation of tooth surfaces for sealants, treatment of gum disease, and soft tissue removal. It can also be used to shape gums, fix conditions that restrict tongue movement, and reduce the pain associated with cold sores and fever blisters. The use of lasers in dentistry is constantly evolving, and new treatments are being added quickly. Glenwood Premier Dental is pleased to offer laser dentistry in Hazlet as part of our commitment to advanced dental care. To make an appointment with one of our dentists for more information about laser dentistry, call (732) 264-4477. What Is the Difference Between Cold Sores and Canker Sores? One thing that sends people to their dentist is sores in and around their mouths. There are two kinds of sores that appear frequently—cold sores and canker sores—and many people confuse the two. Watch this video to learn more about the differences between them and what your dentist may tell you about their causes. Cold sores are caused by a form of the herpes virus and occur outside of the mouth, usually around the lips. Canker sores form inside the mouth and can be triggered by everything from stress to irritation from dental exams or treatments, such as dentures. If you’re dealing with chronic sores in and around your mouth, make an appointment at Glenwood Premier Dental to find out why. Call (732) 264-4477 to schedule an appointment with a dentist in Hazlet.